I've sung that merry tune about the merits of resonance control often enough to have turned it into a bleeding ohrwurm or ear worm as the Germans call a particularly fetching and memorable melody. How fetching and memorable my little song really is remains of course rather questionable. You see, in the grand scheme of things, the magnitude of performance enhancements that properly engineered equipment stands can make is still not fully recognized. In general terms, it isn't embraced yet as a subject worthy of equal -- or higher attention -- than are proper cabling, power line conditioning and perhaps room tuning. It's one of the remaining frontiers. While Stereophile's Paul Bolin has already discovered the efficacy of Grand Prix Audio's Monaco stand and Michael Fremer too owns some of their equipment, our colleagues at The Absolute Sound thus far seem to have missed making acquaintances with this firm altogether. As a true and rabid believer, I naturally consider this an inexplicable oversight. In my mind, this small company now based out of Durango/Colorado has adopted such a revolutionary execution of solid scientific principles, rigorous applied testing and unique skills of composite manufacture that not reporting on it becomes the equivalent of forgetting to report on Anthony Gallo's Reference 3 or Wilson Audio's Sophia or Meitner's new 2-channel DAC. These are all breakthrough products. They all redefine their genre and what prospective customers shopping them have come to expect. Such highlights would have to seem positively predestined for de rigeur coverage in the mainstream press. Naturally and by comparison, the moons are a mere blip on the radar screen of global audiophile consciousness. But never mind that. How often can one lone fella espouse the virtues of any one particular product before that mere act becomes suggestive of undue advocacy? For those reasons and the fact that I've said about as much about GPA as seems fitting and necessary, I would remain mum on the subject now had not the overdue arrival of a second Monaco in Taos wrought a lot more than anticipated. You see, I hadn't anticipated anything. This acquisition was solely for the crass purposes of creating additional space and tidying up the room. Most importantly, I wanted to facilitate review comparisons wherein two or more loaner components could sit inside a Monaco stand at the same time. A simple swap of cable connections could then compare them under identical circumstances against my references rather than always forcing me to first remove one component from my original 4-tier rack to insert the next one and so forth. After filling the uprights of the new Monaco with sand, I centered both racks on the BPT BP-3.5 Signature in a slight splay away from the wall. This would mimic the angle of toe-in on the Duos and make for easy cable access behind the racks. Having only one Formula Carbon/Kevlar shelf, I decided to reserve it for the most critical source component of Accustic Arts' Drive-1. Since my Audiopax monos need the top shelf for clearance and ventilation, I moved both Monacos as closely together as the power conditioner separating them would allow. I took time to level both stands so precisely that I could bridge the gap between them with the Formula shelf. I decoupled it with properly weight-matched Sorbothane pucks from the two top acrylic shelves housing the Wyetech Labs Sapphire monos under review and parked it smack center above the BPT unit for the transport. The Zanden DAC followed suit one tier down on the right, the Bel Canto PRe2 one tier down on the left. This moved my active core components upwards to each stand's two top rungs. It also turned the amplifiers into true monaural affairs by separating them physically atop their own resonance-attenuating structures. All that really changed from my prior setup? The component flow of the audio chain. 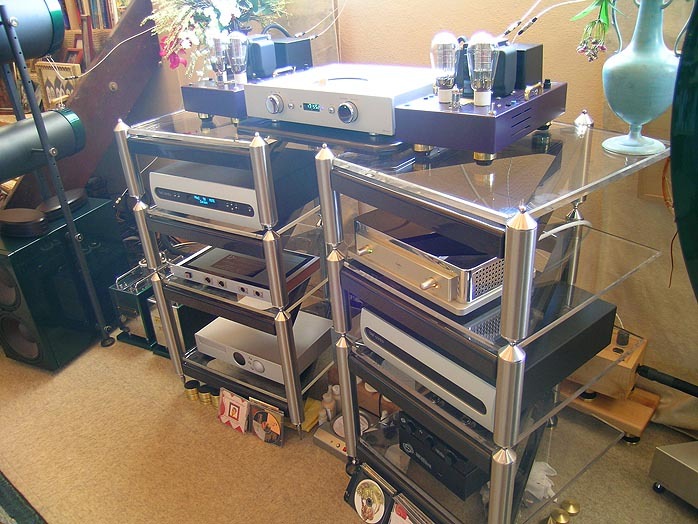 It now worked top-down rather than bottom-up as before when the transport occupied the lowest tier, followed by the DAC, then the preamp and finally the amps on the top shelf. Big deal, right? Yeah - surprisingly so. In GPA's scheme as implemented in the Monaco, each tier above the twin base is decoupled from the one below it by the breaks in the upright columns. Beyond these Vector interfaces, dual O-rings isolate each upper and lower column cap from the sand-filled tubes to insert an additional resonance barrier. Accordingly, the uppermost tier of any Monaco stand affords the highest degree of isolation from those pernicious floor-borne vibrations that always attempt to migrate up any stand. And that's why any prospective Monaco user should work his way down the tiers. Place your most sensitive source component on the top and the amplifiers on the bottom. For reasons already explained, I had been forced to do it the other way around. I was an upside-downie. No mas. Now I'm a rightside-uppie. I wouldn't care one wit if yesterday's installation hadn't paid back with such performance increases as to render me a bit dumbfounded. Simply put -- and not to exhaust your patience with this subject -- I got something that's often mutually exclusive: Better defined leading-edge transients and silky smoothness; truly high-level resolution and major luv and listenability. Knowing my system as intimately as any audiophile knows his or her steady setup, I keyed into this improvement practically the moment the laser locked. 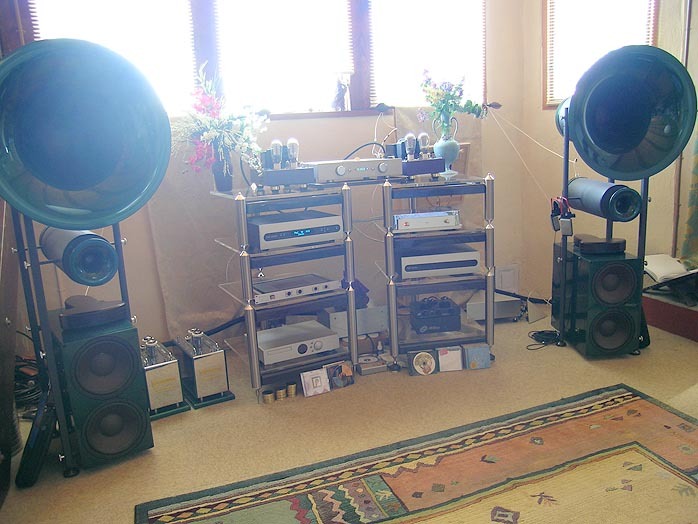 Audiophilia especially at the fringes of what's presently considered the 'accessories trade' is rife with silly claims and disproportionate performance descriptions. I might do this lost world of resonance control little favor then by stating now that the "dual mono" setup of two Monacos netted dividends far too obvious and potent to be relegated to the loony brigade of wacky tweaks for the imagination-endowed. Hearing is believing. Therein lies the rub. Companies like GPA for years now have participated at CES in multiple rooms. And just like the cables hiding behind them racks, makers of equipment stands get little if any respect. Unless they conducted an on-the-spot A/B, of the same system housed in a run-of-the-mill stand and one engineered for audible performance, showgoers have no means to adjudge how much of what they're hearing is due to the stands in the room. In fact, they might harbor dubious notions. After all, that rack rat is sharing a room with such luminaries as Avantgarde, BAT, Joseph Audio, McCormack, Spectral, VTL or Wilson. Isn't he little more than a leech who merely rides on their coat tails? Guilt by association? What's he mean by suggesting that he's responsible for a large percentage of the sonic excellence on tap? Everyone knows that these are top-shelf components. Of course they sound great. And yeah, perhaps one could admit that this stand looks nice. But sound? Gimme a break! And how many dealers do you know who'll conduct impromptu floor demonstrations to show you unequivocally what and how much a particular equipment stand contributes to the overall sound? In the end, it's left to nutcases in the press like yours truly to conduct such comparisons. Of course nobody believes us. It's more convenient to assume we're just raving because raving is so much fun. Do you know what a royal pain in the arse it is to compare two different stands? To do it right, you have to move all of the components from one to the other. And back. And forth. And so on until you're truly sick of it. Perhaps that's why few working reviewers volunteer for such assignments; never mind the potential consequences to one's reputation. What might happen if one dared to not mince words? What might happen if one pronounced a truly superior system of resonance attenuation as rendering audible improvements far in excess of single-component upgrades? The temptation will be to underwrite and soft-pedal. The temptation will be to avoid being perceived as a quack or crank at all costs. Better still, why accept such an assignment in the first place, while this category of devices is still milling about in relative obscurity? Wouldn't it be far more advantageous to join the parade once it was in full swing - when people are actually prepared to accede the possibility that certain stand designs indeed are fully active components, of equal or greater caliber in their overall sonic contributions than a world-class amplifier or a stupendous pair of speakers? Let's play Devil's advocate on behalf of the press for one moment: Isn't it our charge to educate and discover and, on occasion, be the harbinger of valid news no matter how new or apparently disingenuous they might seem? If we don't do it, who else will? What good are news if they ain't news? 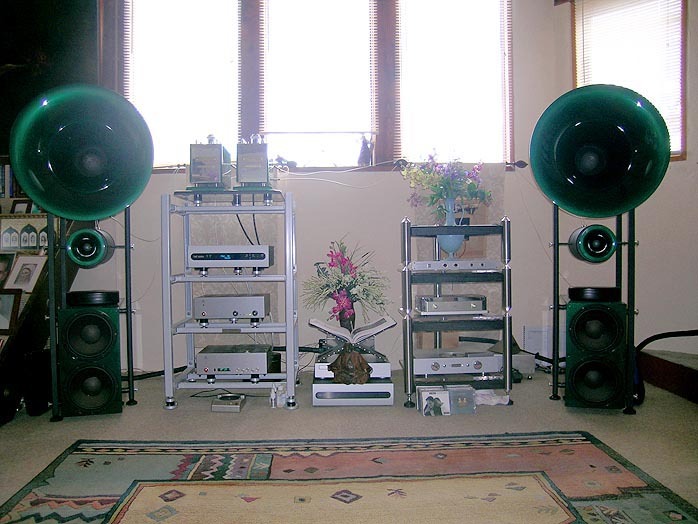 My sympathies are with Alvin Lloyd and others like him who toil in these thankless fields in the hopes of winning enough converts to create the kind of ground swell that Noel Lee generated when he turned audiophile cables into a stand-alone performance category. I have little hopes of doing anything other than scratch the surface of what needs to happen on this subject. But at least I'll rest comfortable knowing that when the time comes and products like Grand Prix Audio's Monaco will be accorded their due respect and recognition, 6moons can point back at our own efforts to remind folks that in our own small way, we did talk about this subject well before it became popular to talk about. Make no mistake - if you're into high-performance audio, you'd be foolish not to investigate this subject at once and without prior prejudice. Whether you end up preferring HRS or the Rack of Silence or the Finite Elemente Pagoda or products by Silent Running and Stillpoints is besides the point - as long as you look into the subject. You will discover benefits of a far more profound extent than you might have ever been prepared to accept. The GPA Monaco works so phenomenally well that I now own two. Besides enjoying their benefits well beyond what I expected, it also enables me to conduct actual A/Bs between stands. The first of these encounters -- against the EquaRack system -- will be chronicled pretty soon. It does imply quite the effort but it remains the only way to find out and learn. At this stage in my audiophile career, I'd consider it a complete and utter waste of money to spend a single further dime on components if you haven't already addressed the resonance control issue to your satisfaction. Satisfaction. How to know when you're getting any? While I can't state that the Monaco is the best -- I haven't heard some of the competition yet -- I can rely on feedback from friends and industry acquaintances to state that it is definitely amongst the very best. If you want to establish a baseline reference for what a truly superior stand can and should accomplish, listen to a Monaco. Even if you can't afford one, at least you'll know what's possible and subsequently not settle for anything so inferior as to constitute flushing hard-earned funds down the toilet. Turntable devotees take note: GPA is currently finalizing a wall-mount system that will hold even an oversized table and a phono stage while incorporating all the benefits of a stand-alone Monaco. I've seen the blue prints while I picked up my stand last weekend. This wall-mount is a thing of beauty and cleverness, with nothing else on the market like it. I dare say this holds true for the Monaco as well. For my money, ears and aesthetic priorities, there's nothing else like it - period!